As a class make sure you watch the mission video. This gives an overview of the objectives of the games and also talks through the navigation of the site. If you are collecting the fee for Phonics Hero from parents you can use this letter. Give out Name Cards to your students on lanyards or stick it in their Reading Record. Watch this quick video to show you how to download them. Parent letter – a letter to send home to parents with their child’s login and information on how to get started. We also have a Spanish and Chinese translation. “We teach early reading and spelling using phonics. We have secured a subscription for each child in [class] to www.phonicshero.com to reinforce what we have taught in the classroom. There are over 850 phonics games which can be used online and on an Android tablet or iPad. Your child’s teacher will be in touch shortly with usernames and passwords. Happy reading! Print off this poster for your classroom door to remind parents to spend little and often on Phonics Hero. You’ll likely be running a parent’s evening to explain how phonics is taught in your school. Here is our Letters and Sounds PowerPoint and Playing with Sounds PowerPoint explaining how Phonics Hero works from a parent’s perspective. (Click on the link, then download to your computer so you can view and edit accordingly. You’ll also then be able to access our notes to guide you through the presentation). Use the star-chart to motivate children to practice at home. 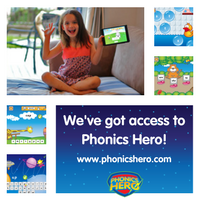 Sign up for your FREE Phonics Hero Teacher’s account now!